Chatwood grew up a fan of the Angels, living in Redlands, California—only 60 miles east of Anaheim Stadium. In 2008, Tyler's senior year at East Valley High School, he committed to a baseball scholarship to UCLA. That season, Chatwood was 9-1 with a 1.05 ERA in 11 starts for East Valley High, striking out 95 and walking 14 in 51.2 innings. In 2009, Baseball America rated Tyler as the 11th-best prospect in the Angels' organization. They had him at #14 in 2010. But in 2011, they had Chatwood as second best prospect in the Angels' organization, behind only Mike Trout. In 2010, the Angels named Tyler as their Minor League Pitcher of the Year. In the summer after his junior year in high school, Tyler played on a baseball travel team in southern California called the Southland Shockers with Kyle Hendricks. Back then, the two never thought they'd be teammates again. Now, in 2018, Hendricks and Chatwood are reunited on the Cubs. 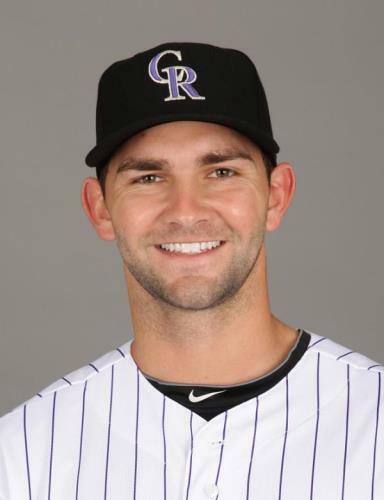 When they were both on the Shockers, Chatwood was a shortstop and starring at Redlands East Valley High School in Redlands, Calif., while Hendricks was a pitcher at Capistrano Valley High School in Mission Viejo, Calif. Kyle Skipworth, a first-round pick in 2008 by the Marlins, also was on the Shockers team. "He raked -- he was a really good hitter," Hendricks said of Chatwood. "We had a really good team. I got to know him a little then, and it's pretty cool to reunite with him. June 25-28, 2018: Tyler was on the paternity list. June 2008: The Angels chose Tyler in the second round, out of Redlands East Valley High School in Redlands, California. (He was, though, the first choice L.A. had in the draft. The club had sacrificed their first round pick when they signed Torii Hunter as a free agent from the Twins.) Chatwood signed with scout Tim Corcoran of the Angels for a bonus of $547,000. "It was an exciting day when I got drafted by them," Chatwood said. "It's the only big league team I ever watched." November 30, 2011: The Rockies sent catcher Chris Iannetta to the Angels, acquiring Chatwood. Jan 13, 2017: Tyler and the Rockies avoided arbitration, agreeing to a one-year deal for $4.4 million. Nov 2, 2017: Tyler chose free agency. Dec 7, 2017: The Cubs signed free agent Chatwood to a three-year, $38 million pact. Chatwood has a fine 93-97 mph four-seam FASTBALL with a little cutting or boring action in on the hitters' hands. He has a 90-94 mph, two-seam sinker. His sharp, 74-76 mph overhand, 12-to-6, knee-buckling CURVEBALL is his best pitch, showing good two-plane break. It buckles the knees of hitters because it changes their eye level. He also has an 80-82 mph CHANGEUP that he has improved. In 2011, he added a CUT FASTBALL. It isn't just the velocity on his fastball. Tyler has some real late boring action on his fastball. It breaks bats and induces groundouts when down in the zone. And his breaking ball has a chance to be a real plus pitch. The hitters' swings against him show that he's a little different from other pitchers. 2016 Season Pitch Usage: 4-seam Fastball: 37.7% of the time; Sinker 34% of the time; Change 2.8%; Slider 20.6%; and his Curve 4.9% of the time. 2017 Season Pitch Usage: 4-seam Fastball: 35.2% of the time; Sinker 28.7% of the time; Change 4.6%; Slider 20.8%; and his Curve 10.6% of the time. 2018 Season Pitch Usage: 4-seam Fastball 33% of the time, his Sinker 25.9%; Change 6.6%; Curve 8.6%; and Cutter 25.9% of the time. Average velocity: 4-seam 94 mph, Sinker 93.4,Changeup 87, Curve 78.8, and Cutter 89.4 mph. Tyler has developed decent command, keeping the ball low in the strike zone. But he needs to maintain a consistent release point or he struggles with his command. He comes at hitters from over-the-top—a good downhill plane despite his size—and is learning to repeat his delivery. Chatwood toned down the stabbing action on the backswing in his delivery, reaping tangible gains in control. Scouts have compared Chatwood to Roy Oswalt because of his excellent fastball/curveball combo. And at six feet tall, they are both shorter than most starting pitchers in the Majors. "I embrace being compared to Roy Oswalt," Chatwood said. "He's one of the top pitchers. I've followed him since I was growing up. He has a bulldog mentality. It's an honor to be compared to him." Tyler has a bulldog demeanor and is coachable. He is an imperfect pitcher but is never overwhelmed. He is never intimidated and always confident. He has impressive mental toughness. As of the start of the 2019 season, Chatwood has a career record of 44-52 with 4.44 ERA, having allowed 76 home runs and 754 hits in 751 innings. Tyler is actually a very good hitter for a pitcher. In high school, he had a year where he had a .521 batting average. In 2013 with the Rockies, he batted .300 for the season. 2006: In high school, Chatwood had elbow surgery. Tyler said the operation was not the textbook Tommy John procedure, since surgeons "tightened" an elbow ligament and did not replace a torn one. He said he had the surgery between his freshman and sophomore years, did not play in his sophomore year, and played center field in his junior year. In his senior year, he pitched but had a 75-pitch limit. May 2012: Tyler spent the month on the D.L. with a chest muscle injury. October 30, 2012: Chatwood left the Arizona Fall League after only four appearances because of fatigue, but there was no concern about injury. August 8-September 1, 2013: Tyler was on the D.L. with right elbow inflammation. March 29-April 13, 2014: Tyler was placed on the D.L. because of a strained left hamstring. He injured it running out a triple late in spring training. April 30-end of 2014 season: Chatwood was back on the D.L. with a right elbow strain this time. July 17, 2014: Chatwood required season-ending Tommy John surgery on his pitching elbow, a right elbow flexor tendon strain. The surgery requires a 12- to 18-month recovery time. 2015: Tyler spent almost the whole season rehabbing from Tommy John surgery. He pitched only 4 innings in the minors. June 19-July 5, 2016: Tyler was on the DL with mid-back strain. Aug 15-Sept. 6, 2016: Tyler was on the DL with upper back strain. July 16-26, 2017: Tyler was on the DL with right calf strain. Aug 23-Sept 3, 2018: Tyler was on the DL with left hip tightness.